Before installing during this time, it’s important to know the different styles and designs you have at your disposal. While it’s as cold as ever, that doesn’t mean you can’t think about the upcoming summer. By starting construction on your pool during the winter, it ensures that you’ll be well ahead and ready when the warmth begins. There are plenty of benefits to installing during the winter, such as the lessened risk for damage. Since the ground is naturally harder due to the cold, it decreases the potential for any type of damage. Additionally, the winter months are much more ideal for grading, rather than grading mud. 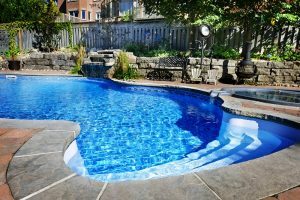 Winter is the best time to schedule renovations as well, if you’d like to upgrade your current pool. Before installing during this time, it’s important to know the different styles and designs you have at your disposal. For in-ground pools, concrete is the most consistent and frequently used building material. The reason for this goes back to its durability. Concrete is built to last, and it’s also well-equipped for holding a large amount of water due to its porosity. You can always replaster the surface, and that’ll lead to a longer pool life. While concrete can always be used, it’s not at all the only choice. You have the ability to add a variety of other materials, like stone or tile, for example. These type of finishes are growing in popularity, especially if you surround the pool with natural stone. It adds a hint of elegance to what’s already an inviting feature. This is an interesting design, because it’s essentially made to fit a predetermined size and shape. The downside to this is that it makes it incredibly difficult to have a true customization with your pool. However, you have an extensive variety to choose from, and this process is much faster in comparison to other installation types. While it may cost more, the surface itself is generally smooth. Contact Paradise Pools Today For Your Pool Installation! This entry was posted on Friday, January 5th, 2018 at 11:18 am. Both comments and pings are currently closed.